The Women's Fellowship of Realm of Glory Church. 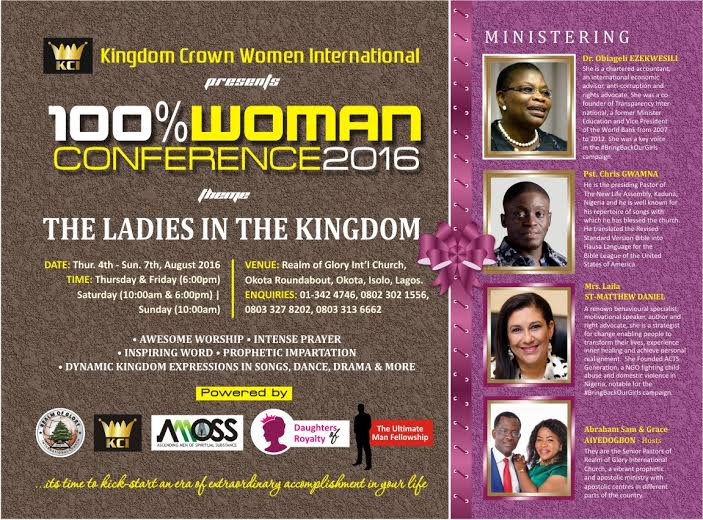 Lagos presents a 100%Woman Conference 2016. Tagged The Ladies in the Kingdom. It's time for all women of the Christian Faith to arise and take their place and enter into their God given Purpose to deliver our nation and heal our land. 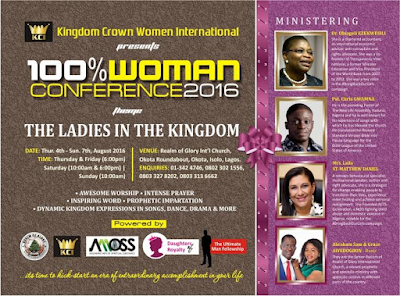 Speakers Include Dr Ezekwesili Obiageli, Foremost Crusader of the Bring back our Girls BBOG Movement, Laila St. Mathew-Daniel, A Transformational Strategist and Behavioural Sciences Consultant, Pastor Chris Delvan Gwamna a seasoned worshipper and Conference speaker, Hosting is Rev Grace Aiyedogbon, President of Kingdom Crown International (KCI) and Co-Pastor of Realm of Glory Churches. This event is for all ladies, young or old. Married or single. Registration is at the Venue.